You'll never hear basketball fans in Texas or Oklahoma ask, "Kevin Who?" Texas Longhorn fans are still a little miffed that Kevin Durant was "one and done" — a freshman who bolted for the NBA as soon as possible — but they can hardly begrudge his success as a pro. And Oklahoma fans are thrilled that the NBA Rookie of the Year moved with the whole Seattle team and franchise to become the Oklahoma City Thunder in 2008. 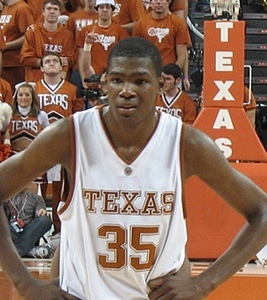 In his only year at the University of Texas, Durant was the first freshman to win the Naismith College Player of the Year award. He then won four NBA scoring titles and made five all-star teams. Then he led the United States team to an Olympic gold medal in 2012. In the current season, Durant has averaged thirty-two points, 7.4 rebounds, and 5.5 assists per game. Oh, and I can't forget the Most Valuable Player award he won last Tuesday, collecting 119 of the 125 possible votes. What's left for a guy who accomplishes all this by the age of 25? When he stood up to give his acceptance speech, in his tailored suit and horn-rimmed glasses, Durant looked like any successful young businessman, if you didn't happen to notice that he is six feet, nine inches tall and has 250 pounds of muscle well-distributed on his lanky frame. But it was the speech that had hard-boiled sports writers reaching for their hankies and iPads. Sam Amick of USA TODAY Sports wrote what everybody in the room thought: "It was hard not to leave Kevin Durant's NBA MVP acceptance speech with the strong belief that there will never be another one like it." Never is a mighty long time, Sam, but I can't disagree with you. In 25 emotion-packed minutes, Kevin Durant touched all the bases except his own. For his teammates there was no thanks-to-my-teammates crumb, but he singled them out, one-by-one, by name, and told what each one meant to him. His coaches, especially Scott Brooks, got the same personal treatment. But the best was saved for the woman in the elegant white dress and tasteful gold jewelry. Before Kevin said a word to his mom, it was obvious that Wanda Pratt would never again have to worry about having enough money to keep the utilities turned on. She had to worry about that and a lot more when she gave birth to Tony when she was 18 and to Kevin three years later. 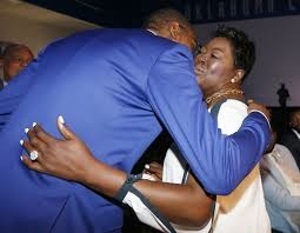 But this was the day for Kevin Durant to tell the whole world about the single mom who worked as a mail handler to make ends meet, and gave him the tough love needed to survive the streets. His words were almost lost amid his sobs. He described her as a single parent with two boys by the time she was 21 years old. 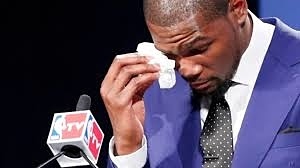 He told about the hardships they endured and the sacrifices she made, and then concluded, "Mom, you're the real MVP." He told about the hardships they endured and the sacrifices she made, and then concluded, "Mom, you're the real MVP." Her children rise up and bless her... “There are some — indeed many — women who do well in every way, but of all of them only you are truly excellent (Proverbs 31:28-29 The Voice). As I listened, I thought of my own mother and the hardships she faced. Growing up on a hardscrabble farm in Tennessee, raped by a relative, physically and emotionally abused, she left home as soon as she could to get a job, first in a cigar factory in near-by Dickson, Tennessee until she could accumulate enough money to go 40 miles farther and get a job at the DuPont plant in Old Hickory. There she met and married the man who would be my father. She was 19 and he just 18 when they married in August of 1932 and she was barely out of her teens when I was born the next June. I didn't know we were poor, but on my dad's seven-dollar-a-week salary we must have been. I remember her pumping an old treadle sewing machine to make shirts for my brother and me, and putting up Mason jars of jams and jellies, and fruits and vegetables to see us through the winter. And I remember that every Mother's Day I would cut rose buds from the bushes that grew on the DuPont fence — white for Mother and Daddy in memory of their mothers who had died young — and red for my brother and me to honor our mother. Mary Margaret and I continued that Mother's Day custom, and we have faded old 35mm slides showing us and four little stair-step children, Bryn and Janet in frilly dresses and spring hats, and Richard and Jim in coats and ties, and all of us with our red flowers. For more than a dozen Mother's Days we have worn white flowers to church — and we will again this year — to honor the memory of Florence Hannahs Discher and Ruth Smith Morrison — our way of saying, "Mom, you're the real MVP." Pictures from the Washington Post. "Mom, You're the Real MVP" by Phillip Morrison is licensed under a Creative Commons License. Heartlight encourages you to share this material with others in church bulletins, personal emails, and other non-commercial uses. Please see our Usage Guidelines for more information.